What does it sound like to sling-shot around Jupiter or to crash land on Venus? What does it sound like when molecules rapidly vibrate around each other or when you’re able to fly through a nebula? Writing music for a visual medium can be challenging enough as it is, but when you’re attempting to rhapsodize upon experiences that people have a hard time wrapping their head around it can create a whole new realm of difficulty. I mean, how do you summarize the feeling of approaching a star that’s ten times more massive than our Sun? But aside from the creative aspect, the task of writing music for planetarium productions is completely different than writing music for any other visual medium. This is a time-lapse taken from 10 am through 9pm on August 13 and results in a 10,000 frame video of still pictures with one picture taken every 3 seconds. This video that was originally 5 1/2 minutes long but now squeezed to make this video 1 1/2 minutes. Shot from the window of my office at LASM. Debris left behind by comet Swift-Tuttle intersects Earth’s orbit. This year, Earth travels through the densest part of the debris field around August 12. 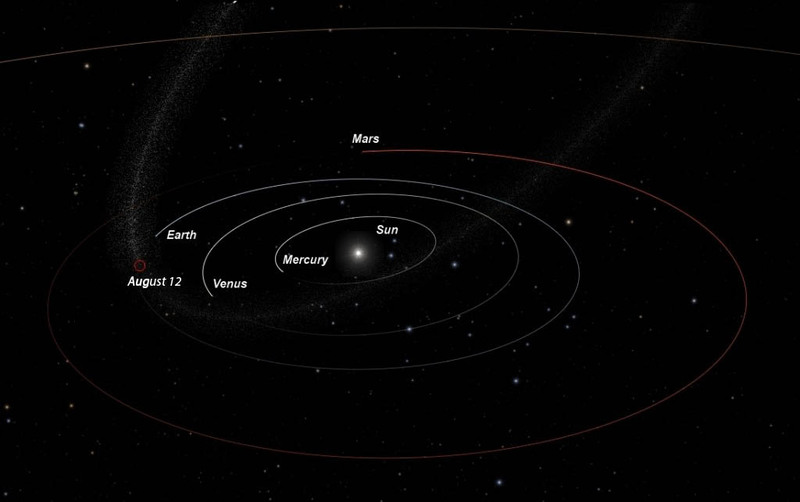 Right now, Earth is entering the debris field of comet Swift-Tuttle. What does this mean? Perseid Meteor Shower is upon us! It takes Earth about two weeks to pass through the field of dust, rock, and metal left behind from the comet. These bits, also known as meteors, fall into Earth’s atmosphere and burn up, leaving streaks of light in what appears to be the northern sky. The meteors appear to radiate from the constellation Perseus. It is not essential to know where Perseus is; just look north. In the middle of the two weeks it takes Earth to pass through the debris (this year August 12th and 13th) is the peak of the shower. The best time to see the meteors is after midnight, this year the Moon will be in the Waxing Crescent Phase, and will set in the early evening. Therefore, the sky will be extra dark, making it perfect for photography. The peak is still about a few days away, but that gives you time to practice your meteor photographing skills in anticipation for the big night. Not all astrophotography is difficult, especially in the age of digital cameras. You can accomplish good results with most digital cameras and a tripod. My two weapons of choice are a Canon 7D with a 180 degree fisheye lens, for capturing pictures that we can use in the planetarium, and of course my Sony Nex-5 (if you’re in the market for a new camera, Sony makes a whole family of Nex cameras at a variety of prices). Small point and shoot cameras can work too! Many of these little cameras come with some if not all of the necessary manual controls. 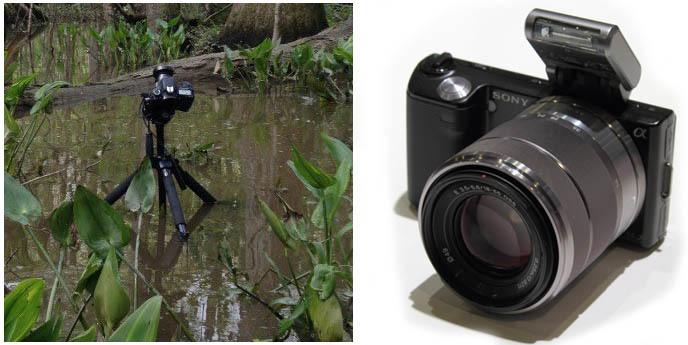 Canon 7D (left) and Sony Nex-5 (right). For the meteor shower I will set up both cameras. Below you can see how the two kinds of pictures look different. The circular “dome master” picture from the 7D projects onto the planetarium dome, while the rectangular picture from the Nex-5 is for printing or viewing on a computer screen. Canon 7D + Tripod + ISO 1600 + Shutter Open for 65 Seconds. Death Valley has America’s darkest night skies, but with these settings we picked up the lights of Las Vegas over 100 miles away. Click the pic to see the full size version. 1. 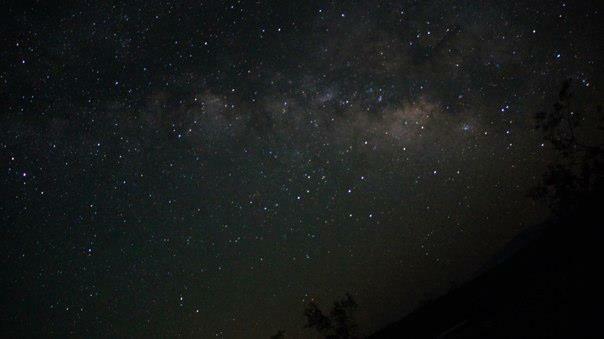 Point your camera north towards the meteors, and switch it to the manual mode. 2. Higher ISOs make the camera more sensitive to light (better for dark conditions). Some digital cameras let you go to ISOs up in the thousands, but don’t get too carried away. These high ISO values can result in noisy images. I usually set ISO between 800 and 1600 for taking pictures of the night sky. Nex-5 + Tripod + ISO 1600 + shutter open for 80 seconds. 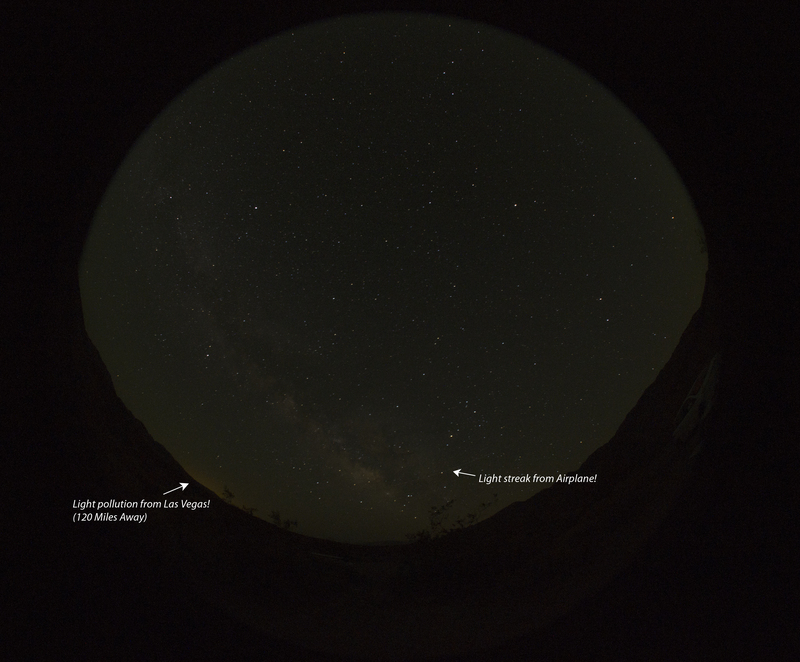 This photo was taken later at night, the Milky Way was in the Western sky (pointing away from Las Vegas Lights). 3. Many digital cameras allow you to adjust your shutter speed. In order to pick up starlight, you need to have a minimum of about 3 seconds of the shutter open. Yes, you read correctly. For everyday photography shutter speeds are hundredths or thousandths of a second. For nighttime shots that shutter needs to stay open for a while to collect as much light as possible. Also, make sure that your f/stop (how wide the aperture is open) is as wide as it can go. The wider the aperture the smaller the f/stop number (f/2 f/4 f/5.6), and the more light enters the lens. 4. Some cameras have a setting called “bulb”, which allows you to leave the shutter open for as long as you want! It closes when you press the picture button again. If you have this setting, experiment with this too. Remember, the Earth is rotating; the stars appear to slowly rise in the east and set in the west. By using the bulb setting and leaving your shutter open for about 10 minutes or so, you will begin to see “star trails” showing up in your picture. So the longer you leave your shutter open, the longer your “star trails” will become. Also, you will get more meteors in your picture. Check out these cool pictures taken by someone else. Click the picture to visit this photographer’s page with more meteor shower pictures. To capture less light over a longer period of time, try longer exposures of 10 min + , bring the ISO to 800 or less. If you want to capture more light over a short period of time, try higher ISO 800+, bring the shutter speed down under 10 min. If your camera is older, try an ISO threshold of 400 + or -. 6. I will leave you with one last tip. Keep that camera as still as possible! If you don’t have a tripod, you can prop your camera up on a table or even on the ground. When pressing the picture button, be very careful not to knock the camera. If you use the bulb function you will have to press the picture button again to close the shutter and finish the picture. It is most essential that you are careful at this point. Disturbing the camera will blur your image. In summary. All cameras take slightly different pictures, experiment and see what results you get with your set up. The more you experiment with different settings and combinations the more you will understand how your manual functions work. It’s a learning experience. Have fun! One of the things people think of when a planetarium is mentioned is the classic rock laser light show. 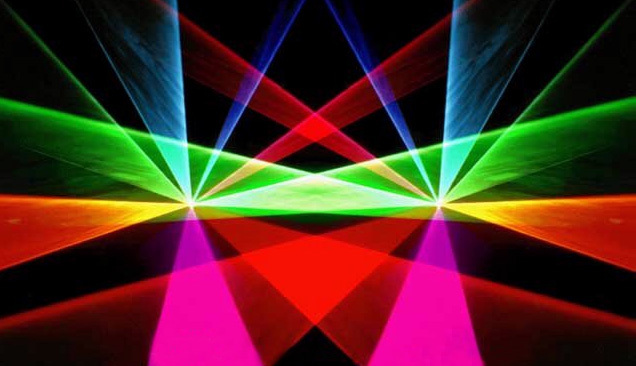 The Pink Floyd laser show has been synonymous with planetariums for a very long time now. But other laser light music shows have come and gone as well. But here at LASM we actually program our own laser light content. As the planetarium projectionist I get the pleasure of sitting behind the scenes and watching the variety of reactions people can have to what they experience under our dome. Being the person at the controls I can rotate the sky, fly you out to the furthest reaches of our universe, dazzle you with laser light, or make you tap your feet with our music and sound system. There is certainly a myriad of ways I can impress people while in the planetarium. It’s a very unique experience unlike what you would get in any other theater. One of the things I see and hear from people after a show is that when they leave the theater they look around trying to figure out where everything is coming from. All they see is a dome above, the circular wall of the theater, and a place to sit. Where is all the sound coming from and where are the speakers? Where do the lasers come from? How do they get the image on the dome? And, how do they make the dome change colors like that?